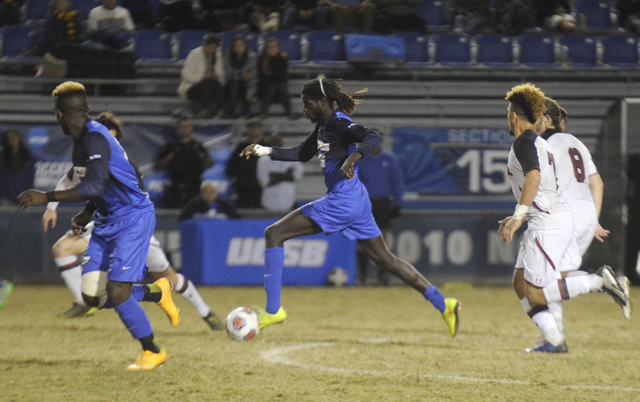 UCSB beats South Carolina to advance to the NCAA Soccer Sweet 16 (Nov. 23, 2015).. The checkered ball seemed to carom randomly around the pitch at Harder Stadium for much of the moonlit Sunday night. “Some” was the operative word — as in hit some, miss some — until a decisive statement was made by Jome. Ismaila Jome fired a 20-yard shot into the net in the third minute of overtime to give UCSB a 1-0 victory over South Carolina in the second round of the NCAA men’s soccer tournament. The winning goal came on the Gauchos’ 15th shot of the night, a week after they had gone 0-for-22 in a 1-0 loss to Cal State Fullerton. “For some reason,” head coach Tim Vom Steeg said, the Gauchos have lately been unable to capitalize on their numerous scoring opportunities. When they did put the ball on target, the goalkeeper — in this case, South Carolina’s William Pyle — was always on the receiving end. It appeared that another attack went for naught in overtime when leading scorer Nick DePuy’s touch inside the box was cleared out by the Gamecocks. But the ball went to Jome, who dribbled past two defenders and unleashed a right-footed blast far out of Pyle’s reach, even though the goalie could hardly explain it. “Somehow, it went in,” he said. So it ended up as some enchanted evening, sending most of the 2,519 fans home happy. South Carolina had them on edge in the second half, having survived an early onslaught. Vom Steeg said the Gauchos could not sustain their energy after throwing “the whole kitchen sink” at the visitors in the first 45 minutes. They had just enough defense to hold off the Gamecocks until Jome, an oft-injured junior from Gambia, produced his biggest moment as a Gaucho. The 15th-seeded Gauchos will travel for their Sweet 16 matchup Sunday, November 29, against No. 2–seeded Clemson, which opened its quest for the national championship by smoking Elon, 5-2. UCSB can’t waste its chances against the Tigers. “I feel the dam’s gonna break,” Vom Steeg said hopefully. The coach reminded the media that at this stage of the NCAA’s 2006 soccer dance, the Gauchos upset No. 1 SMU and went on to win the title. STOUT RED LINE: Bishop Diego High continued playing David-versus-Goliath in the CIF Northern Division football play-offs last Friday night, scoring a 48-6 victory over previously unbeaten Palmdale. The Cardinals again accumulated big chunks of yardage on the rampaging runs of Mike Soracco and John Harris. Their offensive line, an inexperienced unit at the start of the season, has been carving gaps in opposing defenses like grandpa attacking the Thanksgiving turkey. “Combine their execution up front with the hard effort by our running backs, and we have a lot of confidence right now,” head coach Tom Crawford said. The O-line is anchored by Roy Hapeman, a 250-pound senior. The starting guards are James Renick (200-pound sophomore) and Ashton Borgeson (210-pound sophomore). The tackles are Hector Nolasco (225-pound junior) and Gavin Callow (250-pound junior). Dakota Bow-Graham, the only other senior (240 pounds), also sees action. They’re not tiny, but some linemen they faced in the play-offs have pushed 300 pounds. Mike Agnoli and Will Goodwin, both juniors, share blocking duties at tight end and also are defensive starters. Then there’s senior Matt Shotwell, the lead blocker in the backfield and a rare five-tool football player. He blocks, he tackles, he runs, he catches, and he throws (connecting on a halfback pass to AV Bennett for a touchdown against Palmdale). “He’s just phenomenal,” Crawford said. The Cardinals will face their biggest challenge yet at top-ranked Camarillo in the semifinals on Friday night. “They’re very big and really physical,” Crawford said. Both teams are 12-0, a number of victories equaled only one other time in Bishop’s history. GOLF AND VOLLEY CHAMPS: Two area teams reached the pinnacle of success last week, SBCC winning its fourth state championship in women’s golf by 27 strokes, and Laguna Blanca taking the CIF 4AA girls volleyball title in a five-game comeback against Alta Loma.